We want to find the concerts that you will love. It takes time to sift through the many events of SXSW and pinpoint what’s for you. SxSetFinder expedites that process by inspecting music that you regularly listen to— no more sifting through pages of events. In addition, concert buddies are found for you via other users that are recommended the same concerts, so that you can plan your night seamlessly. 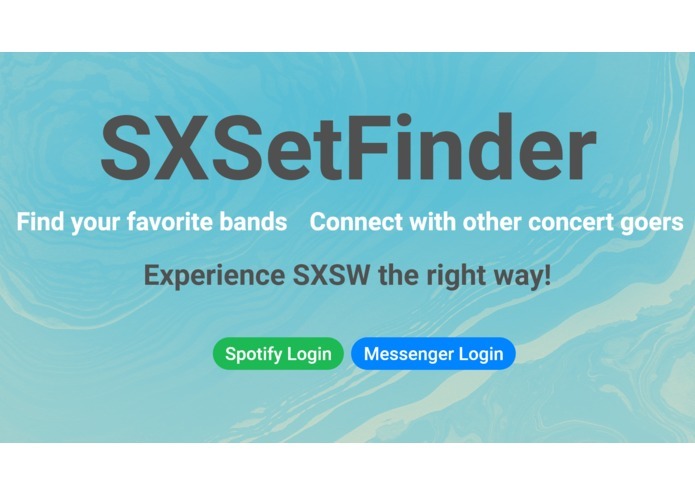 The SxSetFinder matches your top Spotify artists to similar official SXSW performers to find events for you to attend at the festival. This does so through our web interface that acquires Spotify authentication and connects it with our artist database. 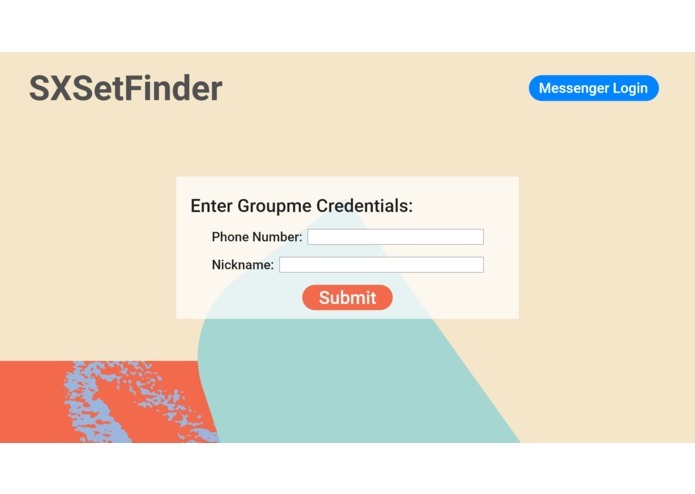 SxSetFinder contacts the user through Facebook Messenger, informs them of the events, and connects them to other users that have been recommended the same concerts. The matches between top Spotify artists and SXSW concerts are made in a Python Flask backend. These matches are then used in an React web interface. Chatbots are then integrated into AWS using the Node-RED platform, using Facebook Messenger and other potential messaging services. 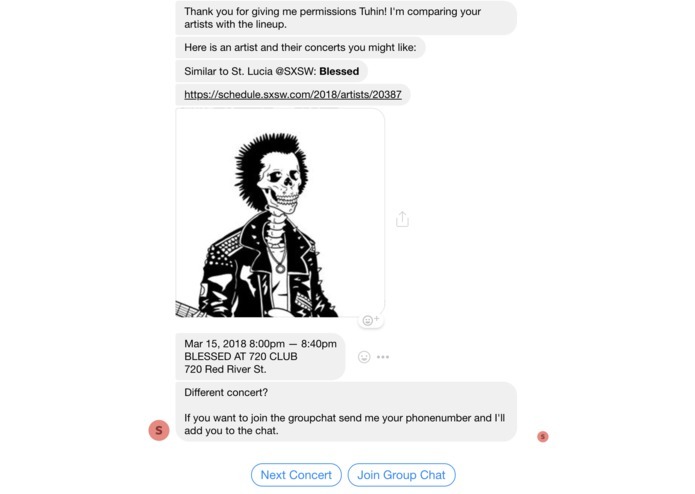 We originally intended to use Facebook Messenger to create a group message with all potential concert buddies. However, we learned that the Facebook API intends to minimize risk of spam bots, so we weren’t able to functionally create a new group message with multiple users— the user would have to create that themselves. We had trouble integrating Spotify authentication. We’re proud of getting the APIs to work, including Spotify. The data science behind artists matching was interesting. We learned a lot and were able to set clear and consistent goals. There are limitations to what Facebook Messenger bots can do. It’s important to start simple and then expand. 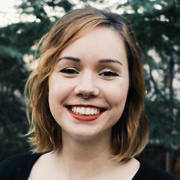 We would like to get full functionality for creating a group message with other concert buddies, possibly using GroupMe. In the future, we would like to implement more artists, improve our bot integration, and eventually integrate free SXSW events. Even further, we would expand to events outside of SXSW. 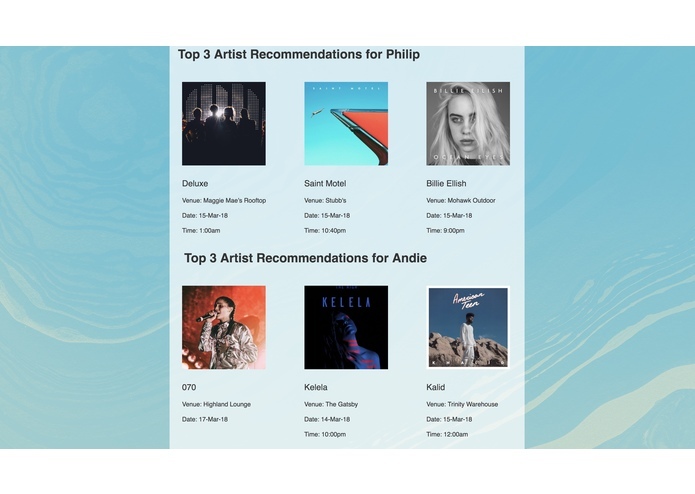 We’d like to use music APIs to stream artists. 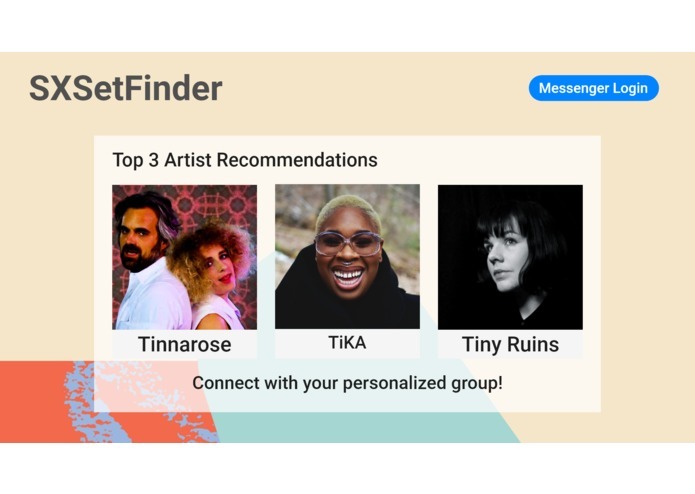 We’d also like to improve recommendations by incorporating social data from Facebook to create more personalized concert groups. Worked on Front-End with React. I love web development. I am passionate about beautiful design and functionality. 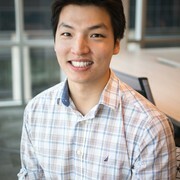 I worked on frontend, primarily design and user experience. I also worked on project presentation. 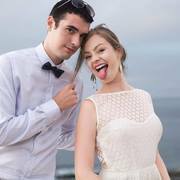 I originally came up with the idea and how to make the algorithm behind the recommendation engine work! Stood up the initial flask app and fleshed out the algorithm in python. Received lots of support from a fantastic team! Set up the front end React architecture, worked on fixing ajax api calls, and worked with teammates assisting in initial front end design process.